← Meek’s Cutoff – The Bleakest Western you’ll ever see. Werner Herzog has made a career of taking bold steps forward in the world of filmmaking. He famously stole his first film camera from the Munich Film School, using it to make Aguirre, The Wrath of God; he is the only director to shoot a film on every continent; and when his friend Errol Morris finally made his debut film, Herzog kept to his word and ate his own shoe. Werner Herzog, is in short, a little unhinged. But this hasn’t stopped him from being brilliant. In his newest documentary, Caves of Forgotten Dreams, he visits the Chauvet Cave, the location of mankind’s earliest works of art, and asks rather large questions about our place in history, our place in the world, and our place within nature. If you’ve seen either of Herzog’s recent documentaries, Grizzly Man or Encounters at the End of the World, then you fully understand his wizened tongue-in-cheek tone. Werner Herzog, like Bob Dylan, has a very distinctive voice, and also like Dylan, has reached a point in his life where he sort of makes fun of himself with it. He asks big questions, but in order to dull how massive they actually are, he asks in a kind of almost broken English, which ultimately makes him sound a little kooky. But he’s not. Hertzog was very hesitantly given permission to enter these caves. Cameras are very rarely allowed in, for fear that they would damage the artworks (all of which are at least 30,000 years old). So in order to film inside, Herzog had to invent lights and equipment that emit no heat, and even then, he was only allowed in for short periods of time. What he brings to the world simply as a visual recording of what exists (a document, if you will) is an invaluable treasure, and while the film has other merits, that alone gives it a solid ranking among his canon. More than just showing us the cave, Herzog uses his natural insight to point out details that put it all in perspective. Two paintings in particular that nearly overlap were made, he notes, about 5,000 years apart. For us, they both lie deep in the annals of prehistory, but with that, you realize that the amount of time between those paintings is equivalent to all of history since Stonehenge. The enormity of that timespan is overwhelming, beyond comprehension. But more striking than the history is the way in which the cave is filmed. Herzog became, with this film, the first person to shoot a documentary in 3-D (Wim Wenders, co-founder with Herzog of the German New Wave, will actually be the second with his forthcoming Pina). He was wary of the medium, considering it a cheap Hollywood gimmick, but upon visiting the caves, and seeing the ways in which the original artists incorporated the contours into their works, realized it was necessary. Herzog uses 3-D technology to give us the finest shots I have ever seen in that medium. They are simply breathtaking. In one shot, the cameras circle around the cave, and more than just feeling like you are in the middle of the chamber, the walls glimmer, and they seem real and textured. It is truly a sensational experience. If this is the future of 3-D, I am all for seeing what other auteurs will do with it, and where it might be in 5 years. But there are still some flaws. 3-D technology is not yet advanced enough to be used for an entire film, in my opinion, and this one would have been better served by utilizing sequences of 3-D (such as the aforementioned chamber shot, and many of the wider tableau shots depicting individual paintings), while the rest remains in 2-D. Things like exterior birds and flora can be distracting, and even disorienting, let alone the occasional use of handheld (shaky-cam) 3-D. But these are things that can be fixed in the future, and are worth enduring for the sake of those images of magnificence. Herzog could talk for days, reading grocery lists, and I would love to listen to him. His accent makes almost everything he says into a kind of joke, but all the interviews and anecdotes in the world slip away into meaninglessness when put up against those paintings. You would think that after 35,000 years of experience they would look like finger painting in comparison to Monet, but you’d be wrong. Many of these paintings are unbelievably artistic, and by their mere age heightens their beauty. Herzog has made “better” documentaries, that get at deeper truths, and tell more interesting stories. But while this is quiet and subtle in comparison, it is worth it just for those last 15 minutes when he shows you the close-ups of the paintings. And you know for a fact that Herzog has never had a better subject than Chauvet. 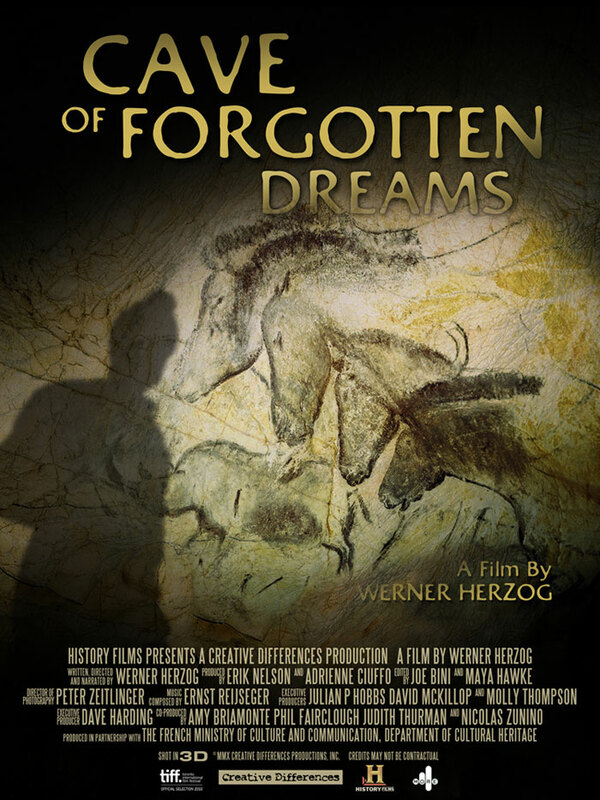 This entry was posted in Reviews and tagged 3D documentary, Cave of Forgotten Dreams, Chauvet Cave, Werner Herzog. Bookmark the permalink.